1001 Remedies combine rare essential oils which are carefully chosen for their healing properties. The combinations create unique synergies and they use optimised concentrations to neutralise side effects. They use what they see as 'star ingredients' that are pure and natural and carefully selected from around the world, such as Myrrh - a natural anti-inflammatory and Neroli to fight anxiety and stress. 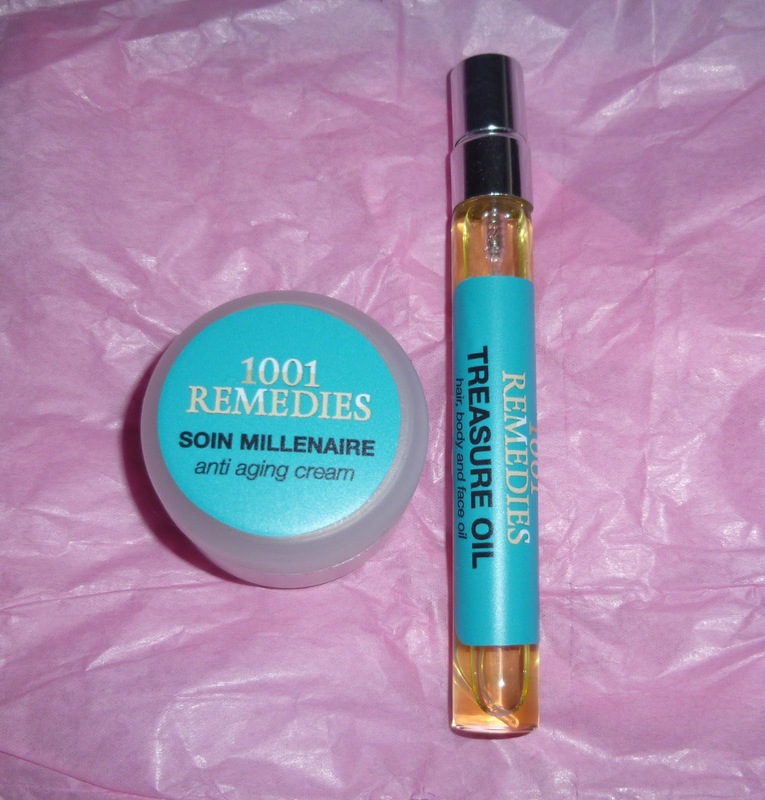 I received these samples from 1001 Remedies to try from their Instagram page for sharing my dream beauty product. 1001 Remedies sent me Soin Millenaire and Treasure Oil. Treasure Oil is an oil for the face, body and hair. It's not an overly runny oil so it is much easier to spread and use efficiently. This contains argan oil which revitalises and prevents against dryness. I can definitely vouch for this as I've seen a noticeable difference in my skin and its level of softness, especially when I combine using Treasure Oil at night and Soin Millenaire in the day. This product can be used to prevent stretch marks, make your hair shiny, protect the skin from damage and can be used against redness due to its antiseptic properties. A complete all-rounder! Soin Millenaire is an age defence skincare cream which promotes nourishment and radiance for the skin. This product can be used day and night but I've found it works quite well as a day cream under make up as it's a light cream that sinks easily into the skin. This cream contains maitake as one of its 'star ingredients' which they claim boosts collagen creation and increases the firmness of the skin. These are definitely high-end products with Soin Millenaire being £69 and Treasure Oil being £39. It's worth the splurge if you're a fan of the benefits of aromatherapy and believe strongly in the properties of the ingredients! Have you heard of 1001 Remedies before and do you own any of their products? Oh wow the treasure oil sounds interesting! I've never heard of these before but they do sound lovely! In a nutshell: if you combine charity shop perusing, a love of jewellery & a dash of nail polish – you get me! © 2015 The Beauty Lane. All rights reserved. Simple theme. Powered by Blogger.